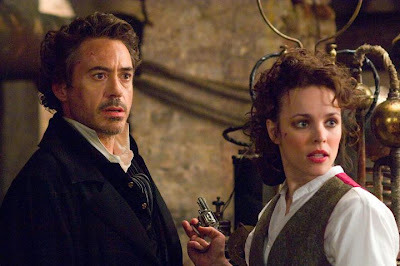 Sherlock Holmes was my most anticipated movie for the month of December. Thankfully, Avatar blew me away, because this one didn't. Don't get me wrong, this is a decent flick; but no where near the brilliance of Avatar. 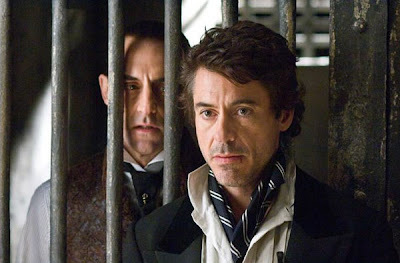 Sherlock Holmes features Robert Downey Jr. playing the famous London detective with the role of Dr. Watson being filled by Jude Law. This tag team works to stop the notorious murderer Lord Blackwood (Mark Strong) from continuing his reign of terror on the London streets. Downey and Law were the driving force of this film. If two different actors played these parts I am sure this movie would have been closer to mediocre. Their chemistry as Watson and Holmes creates a relationship that viewers would think has spanned a lifetime. The duo also provides comedic relief throughout the film with the brotherly like exchanges (Get that out of my face. It's not in your face it's in my hand). The whole cast fed off the energy and the wealth of acting experience from these two Hollywood superstars. With her third movie this year (State of Play, The Time Traveler's Wife) Rachel McAdams plays her worst character of the year. Thankfully, she looked absolutely gorgeous dressed in her vibrant attire contrasting the dull tones of the industrializing London backdrop. Adams role was not very complimentary to the overall plot and hardly felt like worthy adversary to Holmes himself. In the film she supposedly possesses the same cerebral qualities of Holmes, but I never felt it. I had a hard time believing her to be a beautiful but deadly strong female role. Sherlock Holmes is a well written good vs. evil story driven by it's strong main characters. Holmes and Watson playing as the good guys, Lord Blackwood the bad guy. The script was quick paced and was full of lightning fast witty dialogue. If you sneeze you may end up missing a paragraph of dialogue (a big minus in my book). If you don't listen very closely you may have a hard time understanding these Brits and their version of "English." 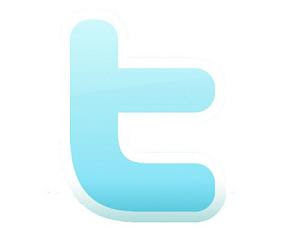 Anyone else find it funny that it is hard to understand English from English people sometimes? I found myself many times relinquishing understanding of what was said and focusing on the next piece of dialogue so I didn't miss anymore of the plot line. The script however, does a good job at unfolding the details of the plot even if you do miss the Usain Bolt-like dialogue. This film does a very good job at illuminating small details in the story and then revealing their importance in the last act of the script. Holmes observes everything around him meticulously and if you are keen with your eye you too can see small clues in his investigation. Most of the time the clues don't mean anything until Holmes' superior intellect explains it to the audience. This type of storytelling was unique and displayed Holmes' overall control and perception over all the events surrounding the Blackwood mystery. I loved watching the drama unfold in this manner. Director Guy Ritchie has his style written all over this film. His lightning fast paced editing, the dull and dreary tones during the day and especially at night, and the use of slow motion shots emphasizing action (boxing, explosions). Ritchie definitely did himself a favor when he dumped that hag Madonna and did himself another when he signed on to this project. This mainstream film is a great way to get Ritchie's unique style into some more Hollywood projects, and most likely the Holmes sequel to this one. Another piece of this production that needs major credit is to the Art Director James Foster. 19th Century London is not an easy setting to pull off. The dress, the buildings, the carriages, and everything else on camera immersed the viewer in the time period like actually living there. This brilliant work was something that captured my attention and will go unnoticed by many; but going unnoticed in this sense translates to a job well done. Overall, Sherlock Holmes is another re birthing of an old story in 2009 (Star Trek). 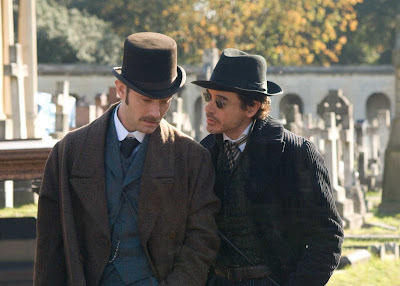 Robert Downey Jr. and Jude Law thrive in the main roles and the supporting cast makes this project even better. 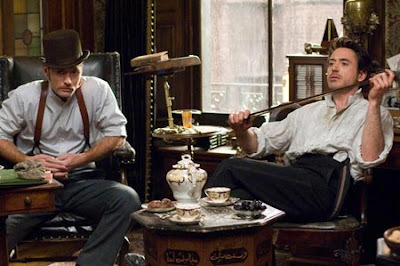 The nefarious Lord Blackwood is a perfect adversary for Holmes and is pulled off masterfully by Mark Strong. Strong is an underrated actor and a film like this should boost his resume. Look for him in feature films in the future. The action in the film is exhilarating to watch in beautiful slow motion, the time period is perfectly set, the writing is crisp, and the music sets the mood each time it flows from the speakers. 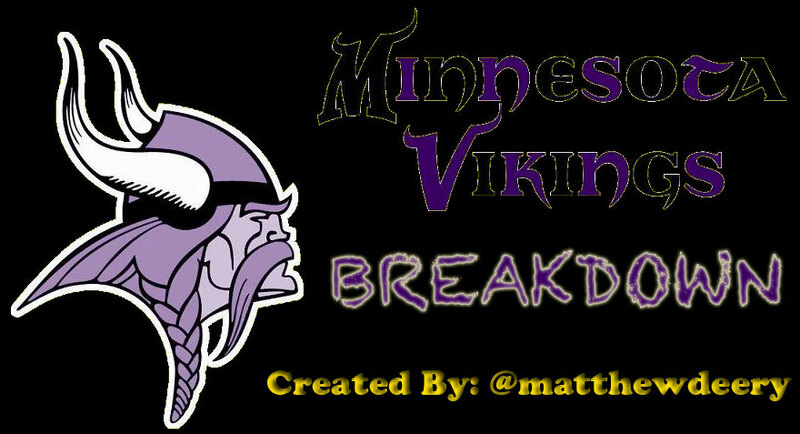 This was a very well rounded project. Sherlock Holmes is a sensationalized version of the Sir Arthur Conan Doyle tale, but this version is definitely worth your time and money.